Ma Kettle is an arthritic senior Lab who walked 30 miles to try to get home -- only to be rejected by her former family once she arrived. The dog had seen a country song's amount of sadness already. Ma Kettle's previous owner -- who called her Lady -- died in 2012, leaving her homeless. She was adopted out of the Chautauqua County Animal Shelter, in Kansas, but then given away again for not getting along with a new puppy. Her life has since become a fairy tale. Ma Kettle's story went viral, catching the attention of an animal-loving heiress -- who has now whisked the dog off in a private plane to Odessa, Florida -- about half an hour from Tampa -- where she'll live in an 11,000 square foot home on 100-odd acres, with a whole menagerie of furry rescue companions. The story resonated online and with Rosburg, who had recently lost her senior black Labrador, Granny, said her assistant, Barbara DiCioccio. Rosburg, 65, contacted her staff to rescue the dog from the Chautauqua County Animal Shelter in Sedan, Kansas. 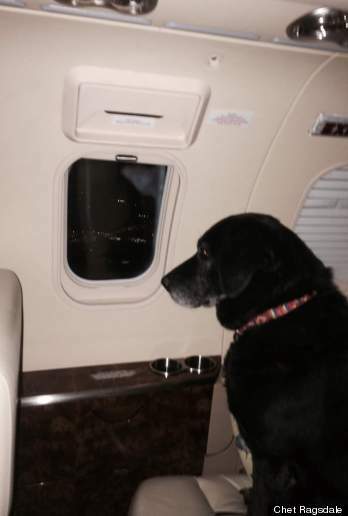 At 4 p.m. Thursday, her assistants Chet Ragsdale and Barbara DiCioccio boarded a jet to Kansas to pick up the dog; they returned about 10 p.m.
A volunteer at the animal shelter, who asked us not to use his name, told HuffPost that this grey-faced girl -- whose last long trek toward family ended so badly -- seemed enthusiastic, still, about her new journey. "She got on the jet without problems," he said. "She just walked up, wagging her tail fast and happy."